What factors lead to the emergence of an ethnically defined neighbourhood? In many cases, racism and ghettoization are the inarguable causes, and Vancouver, like any city, has seen its share of these. From Hogan’s Alley to Japantown to Chinatown, there have certainly been cases where community members were made to feel unwelcome anywhere else. But the history of Vancouver’s Jewish community, and the neighbourhoods it has called home, has been much more complicated. In the late 1800’s and early 1900’s, as Vancouver made the transition from a cluster of small settlements to an officially recognized city and hub of industry, Jews made their homes in the upper-class West End and working class Strathcona (known at the time as the East End), living alongside the city’s diverse ethnic groups. The city’s first synagogue and Jewish day school were established in Strathcona to serve the small community living there. Both the West End and Strathcona were a short walk from Downtown, reflective of an era when private car ownership was still a rarity. As Vancouver’s population continued to grow in the 1920’s and 1930’s, new immigrant groups settled in Strathcona. At the same time, Jewish community members who had achieved a degree of business success opted to relocate their families to the more well-regarded neighbourhoods of the West End, Mount Pleasant, and Fairview, a short streetcar ride across False Creek from Downtown Vancouver. In 1928, Vancouver’s first Jewish Community Centre was built at 11th Avenue and Oak Street, in the heart of Fairview – a clear indication of a shift in the community’s centre of gravity. Institutional growth stagnated in the 1930’s, hamstrung by the crashed economy. But the late 1940’s brought an overdue resurgence. 1948 alone saw the construction of three major community facilities along Oak Street: orthodox synagogue Schara Tzedeck (a new facility for the congregation previously located in Strathcona), conservative synagogue Beth Israel, and the new Talmud Torah Jewish day school. These new facilities arrived just in time to serve a booming post-war population. Between 1941 and 1951, the population of Greater Vancouver rose 42.8%, from 393,898 to 562,462. In the following decade, it increased by an additional 40.6%, reaching 790,741 in 1961. Throughout, the region’s Jewish population grew steadily at roughly 1% of the overall population. As the city’s population grew, so too did the footprint of residential and commercial development. 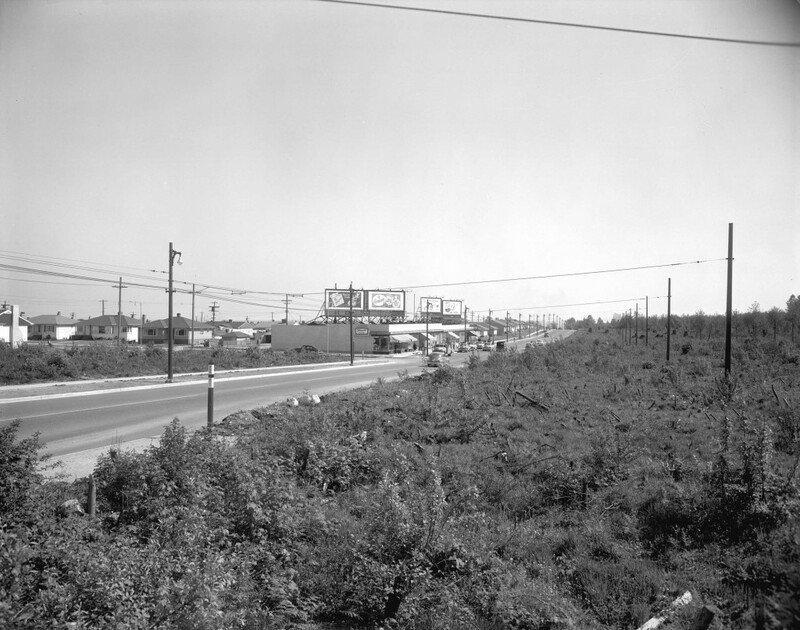 A major change occurred in 1950 when the Canadian Pacific Railroad released a vast tract of forest stretching from 41st Avenue and Granville Street to 57th Avenue and Main Street. The middle third of this site, reaching from Oak Street to Cambie Street, was soon identified by city planners for development into a residential community anchored by a commercial hub at the intersection of Cambie and 41st. 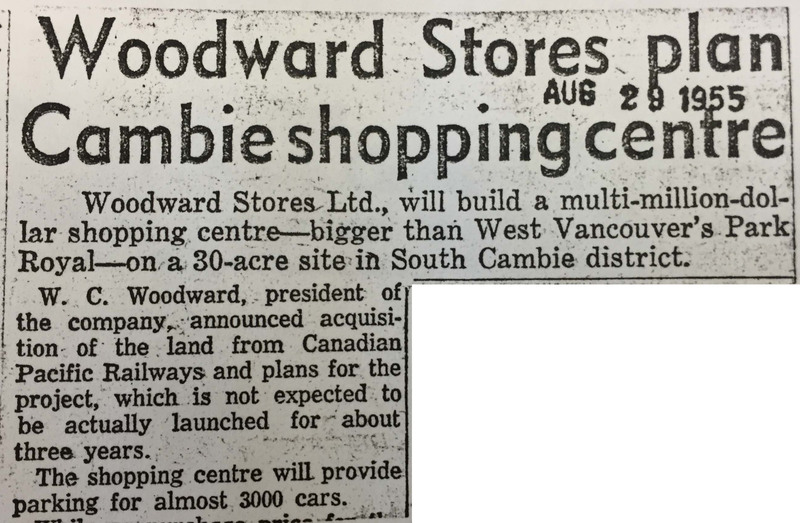 This commercial hub would soon become known as Oakridge Mall. It opened in 1960. 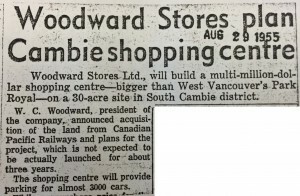 Jewish Independent article announcing construction plans of Oakridge shopping centre, August 1955. 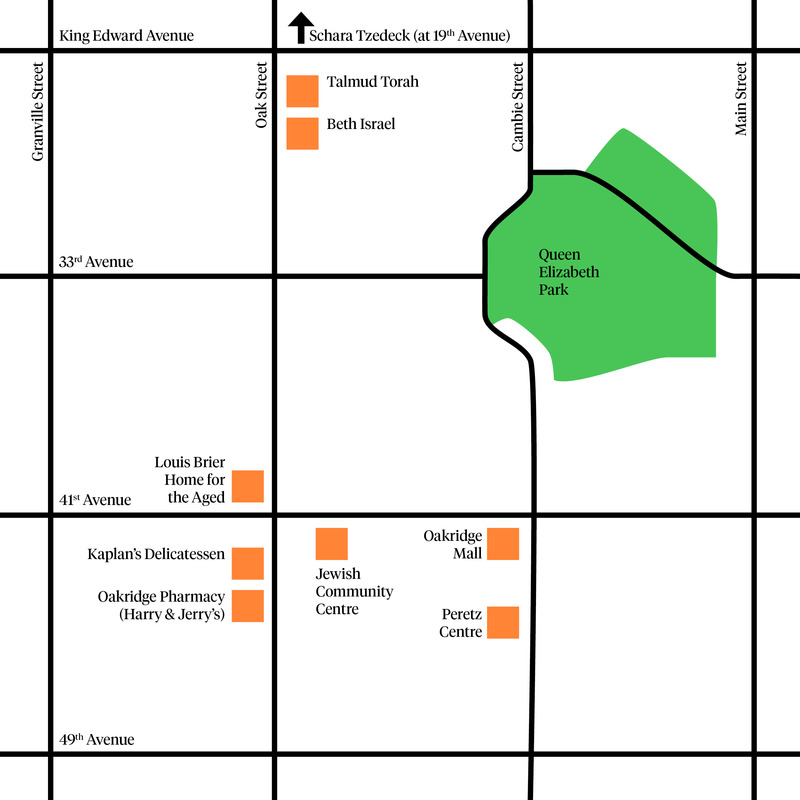 The construction of this new neighbourhood, Oakridge, coincided with a trend of improved financial security among many members of the Jewish community. The large lots and bungalow homes of Oakridge fit the aesthetic of the post-war middle class ideal that many young families – Jewish and not – aspired to. A short drive from downtown, Oakridge was in many ways a suburb within the city limits; a safe, quiet area in which to raise a family. Those who grew up there remember it fondly still. Mort Dodek: Jewish people did live in Kerrisdale, but it really wasn’t considered to be a Jewish area. Irene Dodek: No no. That was really the only one. MD: And many people, like ourselves, like my mother and my father, lived in Little Mountain area – Queen Elizabeth Park area. And that had been a semi-Jewish area for one time but many people moved up into the Oakridge area. It was considered to be an ideal location, because of the new facilities, the new schools, the new shopping area. ID: And if people were ready to build, or to buy another house, that would be where they would buy, was in Oakridge. MD: So this was, it was kind of a post-war boom of building. This was in the 50s. So then people had money, and mortgage money was easy to get, so that people felt comfortable without having to feel that they were exposing themselves to too much of an economic problem. Wendy Fouks: Families were, I think [our parents] were just grateful that the war was over, and there was this booming economy, and a feeling that all was right, in certain ways. I mean, the Cold War was on and all that but it was just very innocent. There weren’t worries about something terrible happening. You felt really safe. You could go and pick up hitch-hikers. You know, it was a feeling of safety, a feeling of freedom, a feeling of being able to express yourself, a feeling that you couldn’t wait to grow up because you had all these dreams. There was so much out there. There were so many possibilities for us, compared to for our parents’ generation. Perry Seidelman: It was sort of affluent. I never really knew of anybody who didn’t have money, who was poor. Although as I grew older I realized that there is actually a significant number of poor people who are Jewish in Vancouver. I was not aware of that at the time. Harry Caine: This was a wide-open field. I used to look across the street from the drug store and there was nothing here. None of these buildings. It was all wooded, forested, with pheasants running around. Picture Oak Street with just a ribbon of concrete, one lane either way, no traffic lights, no curbs, just gravel on the side. That’s what is was like when I opened the store [in 1960]. WF: It was all bush, from the edge of Churchill right to Cambie Street. There’s a big running track there now but it was all bush. Where Langara Gardens is now, I guess. It was a very different world. I mean, you didn’t have to wear a seatbelt. Cambie Street, looking south from 41st Avenue, 1952. Courtesy City of Vancouver Archives. The arrival of more and more Jewish families in Oakridge caused community organizations to establish themselves nearby. In turn, this created a feedback loop: more families attracted more organizations, and the concentration of organizations and community services attracted more families. By the late 1950’s, it had become clear to some community members that the Jewish Community Centre at Oak and 11th Avenue, in operation since 1928, was no longer adequate to serve the needs of the community. They advocated for the construction of a new facility in the heart of Oakridge, easily accessible by foot. Although this today sounds like a logical argument, at the time it was met with controversy. There was debate within the community as to what was the priority for spending of community funds. The priority widely accepted by community leaders was that support for the young State of Israel must come first. 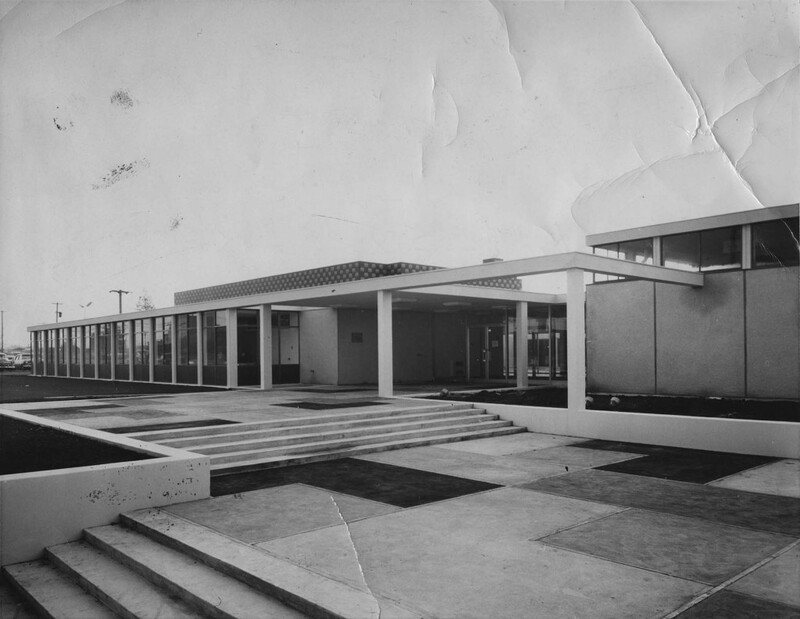 In the end, the new building benefited the community immensely when it opened in November, 1962. A full wing was populated with the offices of community organizations including advocacy and social service organizations B’nai Brith, Canadian Jewish Congress, Hadassah, and National Council of Jewish Women. Activities were available for children, teens, and adults, including swimming, art classes, theatre, as well as a gym and small art gallery. Not just the heart of the adult Jewish community, the JCC also provided meeting spaces for teen organizations B’nai Brith Youth Organization, B’nai Brith Girls, Habonim Dror, and Young Judaea. The JCC acted as the major anchor of the community, with other nearby facilities serving a supporting role. On the opposite corner of Oak Street and 41st Avenue stood the Louis Brier Home and Hospital. 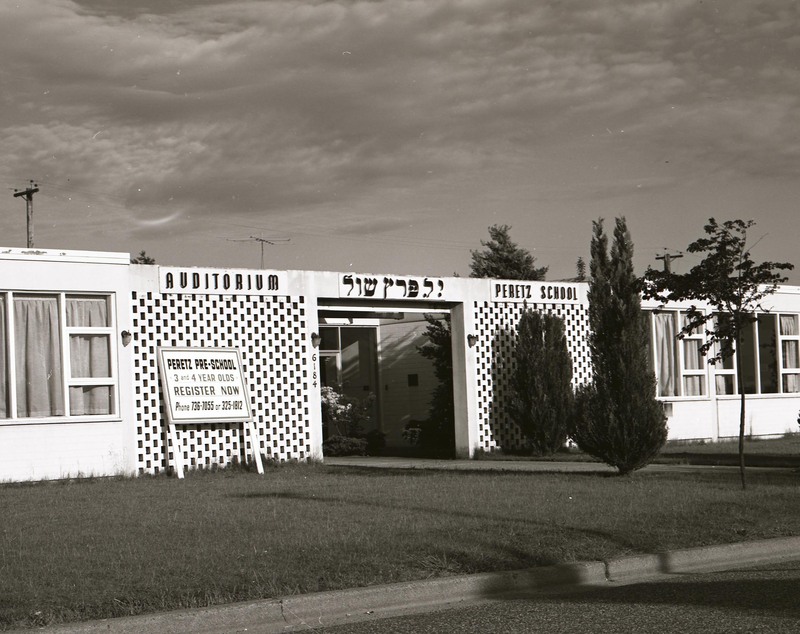 This facility opened in 1968, named for the generous man who bequeathed $100,000 to the Vancouver Jewish Community Fund for the construction of a much needed new space for the Jewish Home for the Aged, operated since 1945 by the Hebrew Men’s Cultural Club. In 2004, the Louis Brier Home became a central piece of the Dr. Irving and Phyliss Snider Campus for Jewish Seniors, which also comprises expansions and long-term care facilities built in 1978 and 1992. 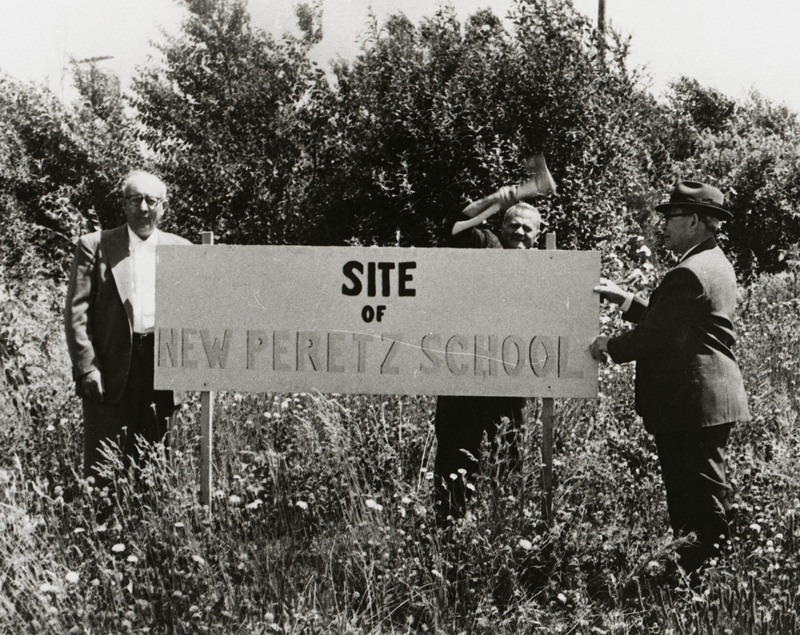 Another important community space was the Vancouver Peretz Institute, which in 1961 relocated from the old house it had occupied since 1945 at West Broadway and Birch Street to a new modern building on Ash Street at 45th Avenue. Espousing the ideals of Jewish Secular Humanism, the Institute takes its name from Isaac Leib Peretz, a Yiddish author and playwright based in Poland in the late 19th and early 20th Century. Along with his contemporaries Mendele Mocher Sforim and Sholem Aleichem, Peretz is considered a pillar of modern Yiddish literature, culture and identity. The Peretz School, as it has been known colloquially, offered after-school yiddish classes and a space for secular community functions for those not affiliated with one of the local synagogues. Ed Lewin: The epicentre was 41st and Oak. The JCC was there, the synagogues were on Oak Street, Beth Israel of course at 27th, Talmud Torah across the street from that, Schara Tzedeck at 19th and Oak, where we were members, Kaplan’s Deli was at 41st and that kind of became the Jewish street and that’s where a lot of – especially the survivor community – wanted to settle. Debby Freiman: It was pretty nice having the JCC at 41st and Oak, and Kaplan’s also at 41st, and the drugstore was run by two Jewish guys, Jewish pharmacists [Harry Caine and Jerry Morris]. I used to walk up there with my dad. I always remember walking up to 41st and Oak to the drugstore with my dad. That was before Kaplan’s even went in there. It was nice to have the JCC there; we just took it for granted. We didn’t think about it but that’s what it was: all these places were around. Vivian Claman: Most of my parents’ friends were all Holocaust survivors. They’re all Polish and all Holocaust survivors. When we moved here, my parents – their friendships – the diversity grew, I mean it changed but also I think they still needed to be, y’know, with Jews, it’s where they felt comfortable, although they hid their identity to the outside world. MD: One other thing that you have to understand is that there was a lot of anti-Semitism at that time. There were people who were uncomfortable living in Shaughnessy, a lot of Jewish people were not comfortable there. MD: First of all, the Shaughnessy Golf Course was there, and it was restricted, no Jews were allowed to join that club. And there were not that many Jewish people living there so we felt that this would really not be an ideal situation. MD: There was a large amount of anti-Semitism between ‘47 – right after the war, interestingly enough, you would think it wouldn’t be – and it continued well into the 60s and 70s. VC: [The neighbourhood looked] completely different [back then]. There was very little. There were no large trees because all of the area where I lived, 52nd and Heather, that whole area was the last to be developed. We don’t even have – we only got a sidewalk on our street recently, and the trees now are all beautiful, but they were just being planted then. PS: It was really a neighbourhood of bungalows, well cared lots. Everybody cared and had nice grass. It was always mowed. Nice gardens, and it was a very pleasant area. It was quiet, quieter then than it is now. WF: It was a very mixed neighbourhood where I lived. It wasn’t technically Oakridge, it was Marpole. It was very multicultural. We had Chinese people on the street, we had – I don’t know if they were Doukhobors, but they were Russian Orthodox – who were very nice. They lived kitty-corner from us. There were families from England, [one of the dads] had been in the English Navy. It was really a mixture. I remember wanting to go to Talmud Torah in grade four because [my friend] went to Talmud Torah, and my cousins went. My dad said, we live in a multicultural society, and he wanted me to go to school with kids from all ethnic backgrounds. ID: From 52nd to somewhere in Marpole was bush, all bush. And our children sometimes played in these empty lots, and there was just gravel on the roads and it was a heyday for the kids. DF: We lived in a bungalow. It had been built in 1952, I believe, and we moved in in 1959. The hazy memory is that not every lot on the street was sold so that over the years, as the lots were sold or as the houses were being built on the lots, we would go onto the building site and explore, you know, climb around the foundations and look at this and that. I think it was well into the ‘60s before the whole street was built. There were a lot of one-storey houses; there were two-storey houses too. There was a nice mix and nothing looked like anything else; everything seemed to be different in my mind, in my young mind. Ken Sanders: The houses were a lot bigger than where I had come from. The trees were very small so it was mostly houses and street and, y’know, lawns. The lawns were quite nice…. There weren’t a lot of gardens because the kids would trample the gardens. We were all pretty active, y’know, we had football games going all the time and other games going all the time and the parents used to try to convince us to go to Churchill, which was down the street to play, but no, no. We just played there. Sandy Rogen: In those days you played outside, we were outside a lot. You know, we were friends with all the neighbourhood kids so you’re outside, going to so-and-so’s house, playing whatever – hide and seek, or playing in their house, out on the street. When I was older, the thing was to go to Oakridge, that was what you did. EL: Mark and Neil Kaplan and Ken and Barry Sanders were anchoring the block. They would sort of go out their doors with a ball, knock on all the doors on their way down to Churchill, and by the time we got onto the field we had a game of touch football. ID: You knew that if your child was on the next block, that there were people that knew her, or him, and you didn’t worry about them. We just didn’t worry about our children playing. VC: We played in the street – we would be gone all day. We played kick the can! I mean those were the days that you would go outside and you would just play ‘til it was dark or ‘til your parents yelled and said come in for dinner. There was a lot of hanging out – I was a real tomboy. You know, I would find, with one girl I would find birds in the nest, or you know if an egg had fallen, we would hatch the egg actually and try to raise the bird ourselves. DF: Churchill was the school where there were tons of Jewish kids. I mean, we didn’t overwhelm the school but we had the most – I mean, by contrast, my husband went to Magee at the same time and, you know, there were maybe five of them – if that many – in his grade. Churchill was where the most people seemed to end up. SR: Every week a new American Bandstand, that TV show, and they had like new groups and new dances and you’d watch it every week to see what the latest dances were and then we would like dance them all together, stuff like that. And then go to Oakridge and look at the clothes that we didn’t buy. PS: We used to go to the park, we used to play sports, casual sport. I remember when I was a teenager we used to go every weekend we used to meet at somebody’s house and have like little parties, and dance to the current music of the time. And when we got to Bar Mitzvah age, we had lots of parties. DF: What did we do after school? Oakridge. I mean, we were walking up to Oakridge two and three times a week. What did we do at Oakridge? Ha! We had the run of the place! It was an outdoor mall then. There was a Kresge’s there, which had a kind of a soda bar and you could go into the soda bar, snack bar, and buy french fries and a Coke, you know, for twenty-five cents. I always remember, you know, if someone brought fifty cents to Oakridge after school, they were really showing off. Then we’d sit with our french fries and we’d keep adding ketchup, salt and vinegar, you know, whatever we did. We did that, we wandered around Oakridge a lot, went to the library all the time, took three, four books out a week. And walked into Woodward’s; in the middle [of Woodward’s] there was a candy counter, a huge square candy counter, and you could go up to the candy counter and buy one candy. And those ladies behind the counter would weigh it for you and you’d pay for it, a penny, whatever, and you’d have it. SR: When I was in high school, so many of my friends worked there. Everyone, I think every person at some point in their life worked at Woodward’s. I did. It was an outdoor mall. I can still see in my mind where [the different stores] were. Gail Dodek Wenner: And then there was the Woodward’s food floor, where we used to go. When we were little, we would go with my mom, and she would put us in the comics section. They had a section there to leave your children while the mothers went shopping, and they had comic books. The kids would all sit there and read comics while the mothers would go shopping. And next to the comic books, they had special chairs – little chairs for little children to sit and read comics. And next to that section was the donut maker. They had this machine that would spit out donuts! It was a whole thing – you could watch how the donut first came out of the machine, and then it would get deep-fried, and then it would flip over and deep-fry the other side, and then it would get spit out and then the icing would get put on and then the sprinkles. It was totally automatic! EL: Our doors were always open. Everybody, all the neighbours, you could be sitting out on any given evening in the summer and people were sitting on their porch… It was a really nice, collegial, and warm neighbourhood. KS: A typical weekend… we’d sometimes, y’know, we’d go on outings to Stanley Park and to Little Mountain and UBC, go to the beach. We liked going to the beach, going to restaurants. When we did those things we’d go to White Spot, A&W. And my dad liked to go to the horse races; sometimes we went to the races. VC: Skating was really big in the 60s and 70s. So we would meet every Saturday and Sunday and go to Kerrisdale skating rink. ID: We entertained a lot. We had a lot of parties, there was always a party. MD: They weren’t wild but they were quite noisy. We would have parties, we were still quite young then, parties where we’d dance. And would put on entertainment, if there were new people coming to Vancouver, we would welcome them. And again, this would be an evening rather than a dinner, and then a big feast would take place around 11 with smoked meat and salami. This was a very common way of entertaining during those years. VC: My mother had been living in France for so many years after the war – everything was bought fresh. So she would literally go pick up stuff and then somehow pull together an amazing meal in the evening. You know, we did not have a freezer full of stuff, at all. My parents took me to the movies. I spent a lot of time with them actually. Like, anytime they had a dinner party, I was at the dinner party hanging out, because there was always interesting people there. They didn’t have a lot of money. But they would get together almost every weekend and have kind of a potluck, where everybody – the women would bring a dish, they would get together, everybody would eat. 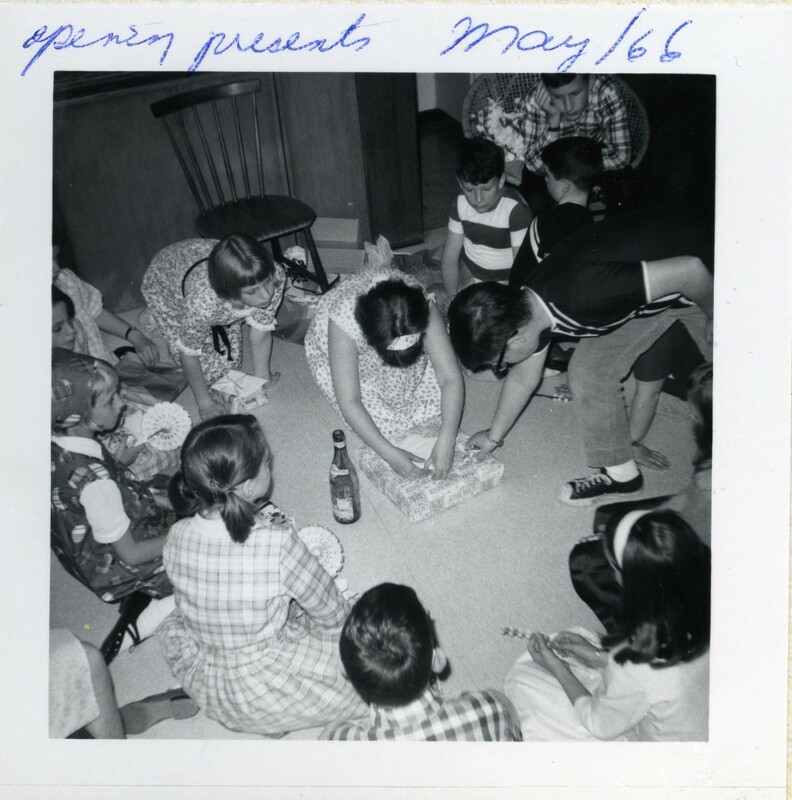 After dinner the men would go downstairs to play cards and the women would sit and talk about their genius children – and that was almost every single weekend. The kids would tag along, y’know, when we were little. VC: Everybody knew everybody. It was an amazing connection… you were part of a big community,… there were only so many stores to go shopping at that had products that you would want for Rosh Hashanah or Passover. There was only one bakery, there was only one butcher. It was a really vibrant community and it was wonderful. I always felt comfortable. Being the daughter of two survivors, I was keenly aware of, always worried that when I would meet people who weren’t Jewish – especially as I got older and I’d move into a neighbourhood, I’d say, ‘I wonder if they would hide me?’ I couldn’t help but think those things… And then the fear of nuclear war, that terrified me too. SR: It wasn’t that long after World War Two. People felt if your parents had been in the war or around the war, there was… a little bit of distrust of people who weren’t Jewish. And if people were German, you really didn’t like them. Is was like a really unsaid thing. You just, if anyone was German you didn’t want anything to do with them. PS: The Jewish community at the time wasn’t as cohesive as I think it is today. The rabbi of Schara Tzedeck would not go to Beth Israel, would not be seen to enter, whereas today they have the Rabbinical Association, all the rabbis get on really well together and they seem to respect each other’s different levels of observance. Whereas in those days they didn’t. And even though my mother kept a perfectly kosher home, and her friends were kosher, and they were good friends, they wouldn’t allow her to bring food from our place into their place because they didn’t think it was kosher enough. Believe me, it was. So, it was a little bit intolerant at the time, less tolerant than it is today. MD: If you want to talk about splits in the community, there was a terrific split between the people who were involved with the Peretz shul and people who were involved with, say, Talmud Torah. It was like two opposite ends of education for children. [editor’s note: The Peretz Centre had socialist roots and indeed was at times a meeting place for the United Jewish People’s Order, a communist organization.] It was not religious and believed that the main language to speak for a Jewish person was Yiddish. And of course, the people at the Talmud Torah, the language to speak was of course, with the establishment of the State of Israel, was Hebrew. GDW: [At Beth Israel Hebrew School,] we learned how to read hebrew in the prayer book, we never learned Hebrew to speak it, to understand it. MD: I was on the first Board of Directors of the Jewish Community Centre, and I was the Athletics Chairman as well. It was a real honour to be able to get involved with this, and it was also a hub of activity for the children. 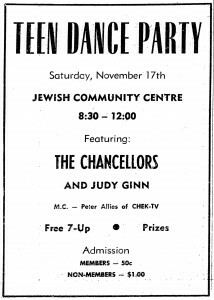 They didn’t have a real program of community centre, but it was an area where they provided meeting spaces for the Young Judea, B’nai Brith, youth organizations. AZA was one of them, it was very strong at that time, during the early 60’s and 70’s. KS: The JCC opened when I was maybe ten or twelve years old, so we’d go there to play basketball sometimes. When I was a teenager I went to AZA there. When I was twenty to about twenty-three, I went to Israeli dancing every Sunday night. That’s where I met my wife, actually. WF: I belonged to youth organizations from the time I was probably in grade six. [First] Young Judea, and then BBG [B’nai Brith Girls]. I wasn’t as active as other people, but that’s where a lot of my friendships started. We got together on the weekends, and then as we got older, Friday nights. Mostly for me I was interested in the social aspect of being with girls and doing fun things, sort of like day camp every week. I think if I remember correctly, we used to meet on Sundays up at the centre. The centre [The Jewish Community Centre] was new in those days. BBG was a very active organization in those days. There was a newspaper, there were newsletters that went out. We must have had games, and parties. And I know we had meetings, and we went bowling – there was a lot of bowling. And probably things to celebrate Israel, Israel’s independence. I don’t remember specifically, I just have a sense of belonging and going to kids’ houses and you know, activities that kids would do. I would say a fair amount of my friends today go back to those early friendships I made. 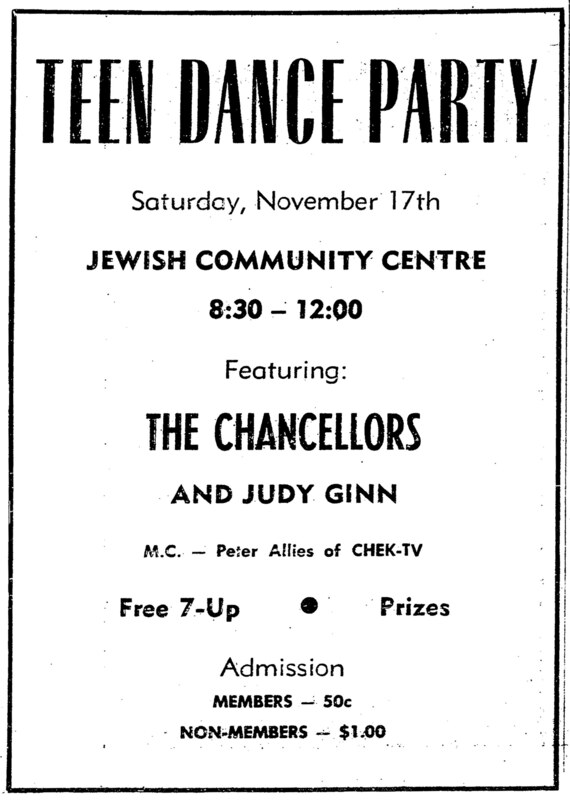 An advertisement for a Teen Dance Party featured in the Jewish Western Bulletin, November 16, 1962. GDW: I think the Jewish life for me really was centered around BBG. I was very active in BBG, I became president of my chapter, went to conventions in Seattle and Portland. I enjoyed BBG for the most part. We used to have fundraisers, we’d try to support different organizations. We did a whole rally on Tay-Sachs testing. Really it was a very social organization, it didn’t have a lot of depth. PS: There was one major youth group, it was USY, and kids who I knew from Schara Tzedeck and from Beth Israel, from everywhere, they all belonged to that. It did not matter what synagogue they belonged to. Also there was AZA was very active at the time, and BBG, B’nai Brith Girls, so there was a lot of stuff going on. DF: In high school, I was involved with Drora, or BBG. It felt like we met every Sunday night, though it was probably only once a month. Our meetings were at the JCC on Sunday night, and there were three boys’ chapters, AZA; three girls’ chapters, BBG; and there was a lot of kids involved in B’nai Brith. We took over the centre on those nights. KS: I went to Camp Hatikvah for four years. There were a few [kids from the neighbourhood, but] the camp really was attended by a lot of kids from Calgary and Edmonton and other places, from Winnipeg. So we were actually in the minority, but I really enjoyed it; I really loved it actually. DF: I remember during the Six Day War in 1967, so that was at the beginning of June, I remember. We didn’t skip school a lot, we went to school. But one afternoon, my friend and I, we skipped school because we were so upset, the war was a big thing, the Six Day War. So we went up to the centre [the JCC], and at that time all the offices [of the Jewish organizations] were off that hallway [where the Norman Rothstein Theatre stands today]. I remember we all went up there, I guess to see if we could do anything, and I remember the radio came on with the news and everyone hung in the doorways of whoever’s little office had the radio on, to see what was the latest with the war. And it was comforting to my girlfriend and I to be there for that. The Six Day War was a big deal because it was an invasion, and people didn’t know how Israel would handle it. And Israel pushed back. We were all pulled in, we were nervous, we were worried. And when the tide started to turn, it was like you could hardly believe it. It was a turning point, I believe for Israel in the world. After that there was a bit more optimism; you began to feel, Wow! They beat them back! You know? We can do this! That, I mean that was a big relief. ID: Most of the people belonged to Beth Israel and were about as observant – or non-observant – as we were. I don’t know any of our friends who had a truly kosher home. I mean, we never had pork or shellfish in our home, but I didn’t have two sets of dishes. Sarah Jarvis: We always got together for High Holidays. You know, candles on Friday night. We didn’t go to Friday night services or anything like that, no, we didn’t do that, but our kids had bar mitzvahs. EL: There weren’t that many Bat Mitzvahs in my generation, it was mostly Bar Mitzvahs. VC: It was very cool to hang out at Schara Tzedeck, even though very few of the people were in fact Orthodox, maybe only two or three families. Most of them lived in that area, in Shaughnessey and around the synagogue and Douglas Park. It was just so much fun to go there even though I had no Hebrew, no religious background whatsoever. I always enjoyed going there because there was a whole bunch of kids hanging out. We’d stay for lunch, and every Shabbat there would be a sit-down dinner. And then Rabbi Hier would give a class afterward and we did dancing and – yes, it was a lot of fun. EL: We were members of Schara Tzedeck. My parents were not Orthodox, but like a lot of survivors, they grew up in traditional homes and they wanted to belong to a traditional synagogue. VC: My parents did not go to any synagogue. My parents are both Holocaust survivors, and after the Holocaust I think they lost their faith. They always believed in God, but I think they just lost the interest in practicing Judaism and, in fact, probably wanted to hide it. And so, my parents did not go to synagogue at all. We did not have any Shabbes [Shabbat], the only thing we had was Rosh Hashanah dinners. And we had Pesach, you know, we had the Seders. I think my mother always fasted on Yom Kippur, but I don’t think they were really interested. It wasn’t until my husband and I became religious that they decided to go back to synagogue and they went to the Reform synagogue [Temple Sholom], which was just a few blocks from their house. ID: High Holidays we attended synagogue with our children. We always had Rosh Hashanah at either my mother’s or [Mort’s] folks, the first or second night. And on Yom Kippur we fasted. We tried to teach the children some of the traditions, the Jewish traditions. MD: And we honoured the Sabbath. ID: We always had a Shabbat dinner. We always, our family was together, and sometimes we invited, we had my mother or Mort’s folks over. But always a nice Shabbat dinner where we lit the candles and said the blessings over the wine and the bread, and it was family time. And there were times when Peter’s friends would say they were going to Oakridge mall, come on, and he would say to them, “No, I’m staying home, it’s Shabbat, I stay home with my family.” On his own he said. So something must have sunk in with him about the tradition. DF: My parents did not belong to a synagogue. My mother probably would have because in Vienna they had belonged to two but, you know, Dad grew up in this Jewish world of New York and Linden, New Jersey, I mean, he didn’t need a synagogue or whatever; that wasn’t his way of life. So my mother’s compromise, or my mother’s solution, was to send me into a cultural education [at the Peretz School]. I really cannot speak Yiddish; I know the characters so when I’m at synagogue now I can follow the characters. But I did get a great cultural education. We would go twice a week after school and on Sundays, and on Sundays we would do things like Israeli dancing and Claire Klein Osipov would teach us singing. Some of my most wonderful memories are with Claire and the songs she taught us. SR: My father was a plumber and he worked in wholesale plumbing with his brother, so he worked at that time six days a week. My mother stayed home. She played Mahjong with her girlfriends a few times a week. And I have no idea what she did the rest of the time, she was home, cooking and cleaning. GDW: Well, my mother didn’t work outside of the house. But once my sister was in grade one, she decided to return to university to get her Bachelor of Arts in Anthropology, and I think it must’ve taken her about seven or eight years to get her degree. I remember going to her graduation, we were all very proud of her. Once she got her degree, she got a part-time job at the Museum of Anthropology. SJ: A lot of the girls didn’t work, they just stayed home and cooked. It was different then, I mean women started to work later in life, but my husband and I had a business. He started the business and I could do secretarial work so that’s what we did. We started it and then he gradually got different people in, but I worked for a long time and I liked to work. SR: My mother was really involved with Hadassah. When she got married, that was what you did. They got married in 1949, you joined Hadassah, that’s how you met all your friends. 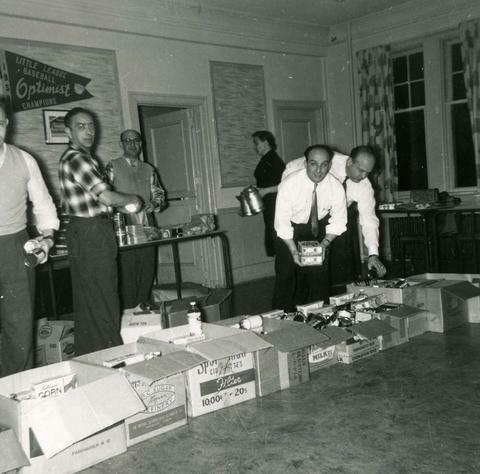 The first Hadassah Bazaar was held in 1952 at the Seaforth Armory. It moved in 1957 to the PNE, a leap from 20,000 square feet to 60,000 square feet. 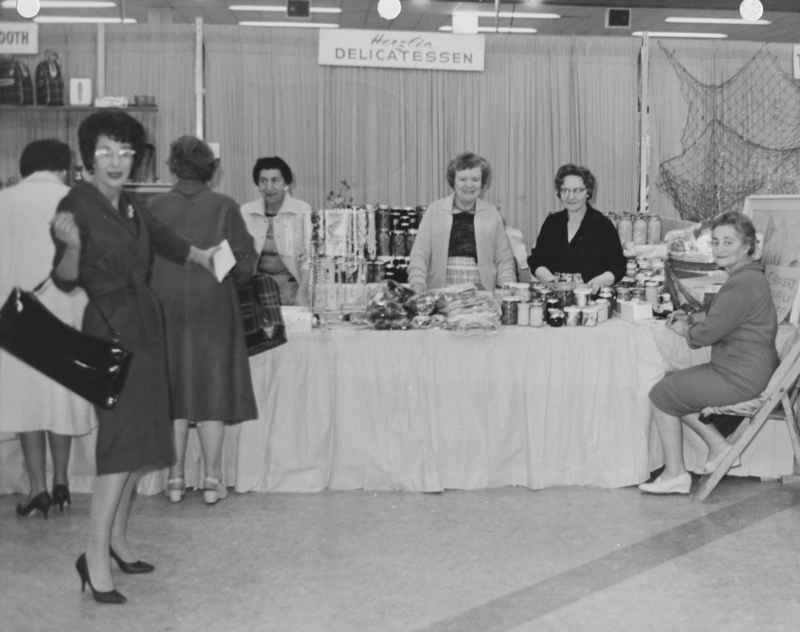 By the 1970s, the Bazaar had grown to fill three PNE pavilions, a space of 100,000 square feet. Marjorie Groberman: There was a woman [who] came here from Toronto and she started to tell us, she spoke at one of our Hadassah meetings and she told us about the bazaar in Toronto. And I absolutely fell in love with the idea and I spent a great deal of time with her and she described to me this huge event but it went to the public and it was held at the Pacific Exhibition grounds in Toronto. And she told me what it involved but the key to that bazaar was selling commercial space which we had never done. We had, had bazaars before at the old Centre at 11th and Oak but they were not open to the public and they certainly didn’t have commercial space and it was what our members put on. Bea Goldberg: The Jewish community was totally behind us, totally. We depended on them, you depended on all the contacts that we had within the Jewish community and they all felt a part of it. It was a uniting effort, you know, for the whole Jewish community, and everybody came. At that time, I mean, we had a lot of non-Jews come to support and to buy, and to buy because we advertised, you know. MG: Alvin Narod was a builder here in town. MG: At that time he was only building houses. So we called him and he came over to Goldie’s and I explained to him what we had in mind and he looked at me like I was a lunatic. You know, he said, ‘the Armoury is 20,000 square feet and have you got any money?’ I said ‘no, we don’t have any money, can you arrange to have booths’ I said ‘I don’t know about booths.’ So he said ‘well, okay we can build the booths, I’ll tell you how much lumber you need and you see if you can get the lumber free.’ So he, I said ‘well how much lumber do we need’ and he said to me ‘enough to build a small house.’ So Sam Heller was in the lumber business and I spoke to Sella and Sella said ‘well I’ll tell you what, I’ll, we have wine for dinner, I will get Sam good and drunk and when I phone you, you come to the house.’ She phoned me in the middle of dinner and I ran to the house and Sam knew I was coming and he said to me, you know, ‘Marjorie what did you come for?’ And ‘Sella said you wanted to talk to me.’ I said ‘Sam, I want to have a bazaar and I need enough lumber to build a house.’ And he said to me ‘are you crazy?’ I said ‘I don’t know how much it costs I haven’t had any…’ He said ‘what are you prepared to pay?’ I said ‘I’m not prepared to pay anything.’ I said ‘but we need, I forget, enough to build a house.’ So he said to me ‘I won’t give it to you but I’ll sell it to you.’ And my heart sank and then he said ‘I’ll sell it to you for $1.’ So that’s how we got the lumber for the first bazaar. MG: The newspapers were terrific. The Province gave us a whole full page for the first bazaar. Alvin Narod and Goldie Edwards and Muriel Bass and I, there used to be an Aristocrat on the corner of Broadway and Granville. We waited there all night from 12:00 to 5:00 in the morning until the paper was delivered. To get that paper we knew the first page was in it. I have that first page, I’ve turned it in to the bazaar. After our bazaar was a big success, in 1959 I got a call from Edmonton, would I come and would I show them how we started. The problem in Toronto was the woman who started it died, Mrs. Dunkelman, so nobody remembered how to begin. So eventually they established a portfolio, national portfolio of bazaars which lots of Vancouver girls held that national portfolio. BG: Marjorie, you were the first that held that portfolio. MG: Yes, I was the first. MG: Yes, I went to Edmonton and Calgary, Regina, I really got to see the country. I went to Quebec City, Halifax, London, Windsor, Peterborough, Edmonton, Calgary, Regina, I mean I, in a period of 10 years. ID: Kaplan’s [Delicatessen] was started by Ida Kaplan. Mrs. Kaplan was a fabulous cook and a baker. It was a wonderful delicatessen. She ran it really beautifully and she was a major cateress in the city for bar mitzvahs and weddings. I remember going to her when it was time for [my son’s] bar mitzvah, wanting to get an idea of what she’d charge. She was listing all the items on the menu: deli meats, corned beef, salami, and whatever. She gave me a price for that, and I thought the price was too high so I said I didn’t plan on serving meat. And she said to me, “If you don’t serve meat, you’re not going to have a good bar mitzvah!” That’s what she said! But she was a very fine cook. HC: Ida Kaplan used to make me dinners, because she used to feel sorry for me working so late [at the pharmacy down the block], because we were open until eleven o’clock. So on nights that she’d see me there, we always had an arrangement she’d make some of these nice beautiful Jewish dinners. And the bank manager would come in, and if we had a quick delivery for a sick kid’s prescription, you know that the bank manager would jump in his car and deliver it for me? That’s the kind of relationship we had on the corner. And it never stopped, it just never stopped. It was fun. 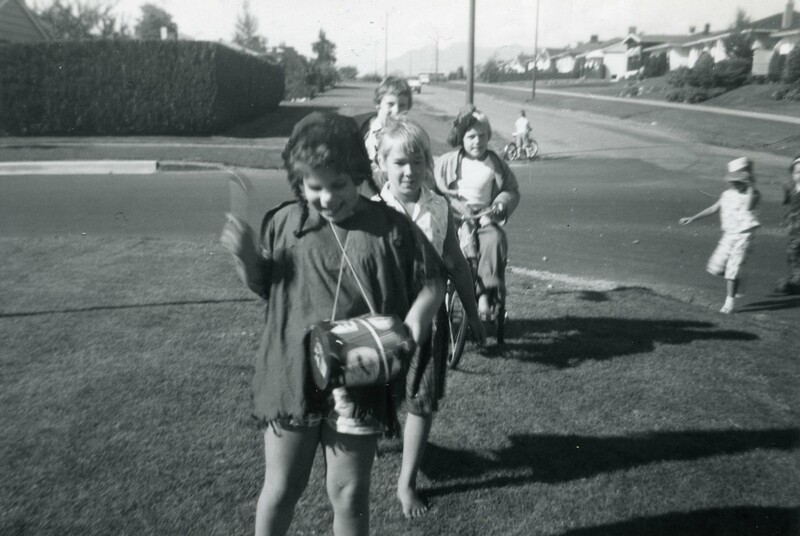 As the children who grew up in Oakridge reached adulthood and began families of their own, they sought out homes in all corners of the Lower Mainland. Affordable options were to be found in nearby Richmond, Dunbar, Kitsilano, and East Vancouver. Ironically, as the community became decentralized, its institutions by and large continued to crop up along the Oak Street Corridor. The Reform congregation Temple Sholom moved into its new building at Oak Street and 57th Avenue in 1989; the Jewish Community Centre underwent a major expansion between 1990 and 1996; Pacific Torah Institute opened its doors in 2003; and King David High School in 2005. However, this growth at the centre has been matched by similar growth in satellite communities throughout the region. The Renewal congregation Or Sholom followed a similar trajectory as Temple Sholom, initially meeting in members’ homes before settling in a former church at Fraser Street and 10th Avenue in 1993. Congregation Har El germinated on the North Shore in the 1970s and grew steadily before moving into their permanent, purpose-built Synagogue in West Vancouver in 1997. Three congregations exist in Richmond: the Conservative congregation Beth Tikvah, and Orthodox congregations Eitz Chaim and Young Israel. Further afield, the Reform congregation Sha’arei Mizrah, located within the Burquest Jewish Community Centre, sprouted in 1973 in Coquitlam, responding to the growth of the Jewish community there. White Rock is home to the White Rock Jewish Community Association. The dispersal of Vancouver’s Jewish community can be attributed to a number of contributing factors. Chief among these has been the stratospheric rise of the region’s real estate market over the past three decades, which has forced new arrivals and young families to choose between a small urban space such as a condominium or townhouse, or, if they choose to live in a house, to do so in the periphery. Second, each successive generation has shown itself to be increasingly comfortable living among non-Jews. Whereas the wartime generation had reason to be cautious, peaceful inter-cultural relations has become the norm for their children and grandchildren. Whether these generations would choose to live primarily among Jews if cost and availability were not influencing factors is a question for deeper research and reflection. For half a century, the Oak Street Corridor has been the heart of local Jewish activity. In the coming decades there is reason to expect that new community services will emerge in areas throughout the region where Jewish families have made their home. Such was the case in the 1970s when Jews living on the North Shore began meeting for Shabbat dinners and services in one another’s homes, forming the basis of Congregation Har El. But a Jewish community is comprised of much more than synagogues alone. It remains to be seen how community connections will be upheld between Vancouver and the neighbouring cities, and whether we will see the emergence of a new hub with the same degree of emotional importance that Oakridge once held. Harry Caine was born and raised in Winnipeg and arrived in Vancouver in 1956. While working as a pharmacist at Vancouver General Hospital, Harry met his future business partner, Jerry Morris. In 1960, they opened Oakridge Drugs at Oak and 42nd Avenue. Vivian Claman and her parents moved from Montreal to Vancouver in 1966, when Vivian was nine years old. They settled in Oakridge the following year. Irene Dodek was born and raised in the small town of Cupar, Saskatchewan and arrived with her family in Vancouver in her late teenaged years. She soon began studies at UBC, where she met her husband Mort. Irene is a founding member of the Jewish Historical Society of British Columbia. Mort Dodek was born in Winnipeg to Polish immigrant parents and raised in Vancouver. At a B’nei Brith picnic on Bowen Island in 1947, Mort met Irene Segall, a new arrival from Saskatchewan. They were wed in 1951 while Mort was completing Medical School at UBC. Mort and Irene raised their three children in Oakridge. Gail Dodek Wenner was born in Vancouver and raised in Oakridge. She is the daughter of Mort and Irene Dodek. Wendy Fouks was born and raised in Vancouver. She has worked for many years as a primary school teacher with at-risk children. Debby Freiman was born in Vancouver and raised in Oakridge. Debby taught ESL for many years, first in the Vancouver School Board, and later at Langara College, where she eventually served as a program coordinator in continuing studies. Bea Goldberg was born in Saskatoon and joined her sister Rose in Vancouver in 1943 after completing university. She met her husband Meyer here and together they raised their two children, Jeffrey and Jackie. Marjorie Groberman z”l was born in Edmonton and arrived in Vancouver in 1937 at the age of 17. Her parents were highly active in community organizations and she carried on this tradition as a longtime leader of Hadassah. Sarah Jarvis was born and raised in Vancouver. Her mother originally came from Lithuania and her father from Poland. She and her husband raised their children in Oakridge. Ed Lewin was born in Vancouver and raised in Oakridge. His parents came to Canada from Europe after the Holocaust in 1948. Ed is past president of the Vancouver Holocaust Education Centre. Sandy Rogen grew up in Oakridge and continues to live in Vancouver. Ken Sanders was born in Vancouver and grew up in Oakridge. Perry Seidelman was raised in Vancouver, a fourth generation Vancouverite. A teacher and school administrator in the Vancouver School Board for many years, Perry was Principal of King David High School from 2003 to 2008. Perry joined the JHSBC board in 2009 upon his retirement from KDHS.